I agree. But to say that Schoenberg lacks melodies or his music is effectively random notes is as nonsensical applied to him as it would be applied to Bach. And many people say those things, rather than that it doesn't appeal to them. Then the musically ignorant shouldn’t say anything at all! I don’t enjoy Bach or Mozart as well as many people here do, but I confess I’m just not into them. That’s all that needs to be said, we shouldn’t tear down the composer just because we don’t ‘get them’. Berg's violin concerto was an early revelation for me too, and I think we're not alone - it's quite common that people find that piece in particular quite accessible. It's a truly magnificent work, a grand statement in the genre; I don't think it's possible to know it and not be moved by it. That being said, it makes me a bit sad that the Berg is so well known while Schoenberg's concerto for the same instrument remains a rarity in the concert hall. Both pieces are absolutely stunning - I really couldn't choose between the two - and should be part of every self-respecting violinist's repertoire; and I'm only half-joking here... Schoenberg's writing for the violin is admittedly difficult (I think Hilary Hahn once said that she had to forget most conventional fingerings and come up with totally new ones!) but given how high the general level of playing is these days, I think there's no excuse for the lack of performances the piece has had to endure. I know for a fact that Isabelle Faust - a wonderful German violinist who has made amazing recordings of the concertos of Bartók and Berg, among others - has been actively playing the piece this season, and we can only hope that both she and her recording label realize the potential of breathing new life into this masterpiece, and recording it with fresh interpretative ideas. Yes, the Schoenberg Violin Concerto is notoriously difficult or, at least, from what I’ve read. This, of course, doesn’t excuse it from being so little known. I recall a concert that my grandfather told me about where the Schoenberg VC was performed and he said “I never heard such an awful racket. Sounds like chicken scratch.” Of course, I disagree with him and he and I were always musical opposites. He once replied to me “You like that Ravel a lot don’t you, John?” which in his own subtle way, it clearly meant that he did not. He also took shots at my beloved Bartók and Ives. Anyway, my point is it doesn’t matter what anyone else thinks as long as you like the music yourself. There will always be someone you can talk to about the music you love, especially here on GMG. P.S. Yes! Faust would be great in the Schoenberg VC. I wasn’t too crazy about her Berg, though, as I’ve got Mutter’s performance (w/ Levine/CSO) imprinted in my mind. I should give her performance another spin soon. If they have heard it and they did not recognize any melodies and it sounded random to them, then that would be a valid description of their reaction. People say equally unenlightened things about Bach all the time. Time to stop beating the dead horse. Again, I agree. 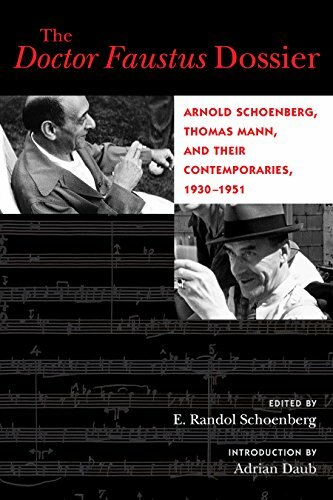 But with Schoenberg in particular, the tendency seems to be to project one's personal reaction onto the music and amplify a mere misunderstanding into contempt. People do say unenlightened things about Bach quite often. But show me someone who says that he singlehandedly destroyed the Western tradition and then we can make a real comparison. In case you missed this under the "Concerts" topic: Schoenberg's Gurrelieder performed by the Philharmonia Orchestra [/b ]under Esa Pekka-Salonen. WOW! Just WOW! The Philharmonia Orchestra is one sharp, nuclear-powered orchestra! We had front row balcony seats and could see everything and hear (just about) everything perfectly! I was not disappointed at all with the orchestra or most of the soloists! Barbara Sukowa softened her hootin' 'n' hollerin' interpretation of the Sprecherin part somewhat: she sounded great! The orchestra filled the stage and filled the hall with great sound when power was required, and became delicate and chamber-like, when that was required. The concert was a sell-out, and a semi-standing ovation was given at the end. Only one thing (or two): the singers for Waldemar (Robert Dean Smith) and Tove (Camilla Tilling) lacked the vocal power to be heard over the orchestra at times: for Waldemar's last song in Part II, the fist-shaking threat against God, Mr. Smith lost the battle for his imprecation to be heard ("...mit meiner wilde Jagd, ins Himmelreich ein!" did not sound as mighty as it should have). The choirs were also extremely good. And as far as the conducting goes, Esa Pekka-Salonen was on target, no strange tempi or additions or subtractions: a fairly slow pace at times, but nothing eccentric, and when speed was called for, the engines were cranked up! The good part: you can hear the exact same concert via Radio 3 BBC! Perhaps the engineers were able to bring out the two main voices via microphone magic! Good discussion! My Schoenberg "gateway" was my hearing of the "Variations for Orchestra" on the radio. To me, it's simple; if one can hear a non-tonal succession of pitches without getting riled-up there is a lot to enjoy. Every note he composed as a mature composer, has been scrutinized and explicated in the myriad of papers written for the academy. In light of this reality, it's hard to label his music as random or haphazard. But pushing aside academics, the music is powerful and monumental in its musicality alone. Whether it be Gurrleider or the String Trio, I believe we are all better musicians and listeners for having listened to his music. Good discussion! My Schoenberg "gateway" was my hearing of the "Variations for Orchestra" on the radio. To me, it's simple; if one can hear a non-tonal succession of pitches without getting riled-up there is a lot to enjoy. Every note he composed as a mature composer, has been scrutinized and explicated in the myriad of papers written for the academy. In light of this reality, it's hard to label his music as random or haphazard. But pushing aside academics, the music is powerful and monumental in its musicality alone. Whether it be Gurrelieder or the String Trio, I believe we are all better musicians and listeners for having listened to his music. And are we better people for having listened to Schoenberg? Now there is a question! Here again is the link to the performance of June 28th of the Gurrelieder with the Philharmonia Orchestra and Esa Pekka-Salonen conducting. The two principal voices are easier to hear, thanks to the radio engineers, than they were from our front-row balcony seats. Where is the link? What am I missing? I finally made it round to the 6 Pieces for Piano, after going through Chopin-Scriabin-Faure-etc.,... especially in relation to Scriabin. The fingers did not obey the head! The 3 pieces for chamber orchestra, without an opus number, is a fascinating set of miniatures. I was not familiar with them before this week (I bought 11 CDs of Boulez conducting the composer's music; more on that later...) and I'm intrigued! They are very short, almost Webernian in that sense - but the music is well worth hearing. There's always something new to discover, waiting around the corner. The radio broadcast does allow one to hear the Waldemar part better than in the hall: I have relistened to the whole concert, and remain impressed by the orchestra, choirs, and most of the soloists. Nice, and thanks! I do want to sit and listen . . . soon. I heard an excellent performance of the Piano Concerto today, played by Kirill Gerstein with the Helsinki Philharmonic Orchestra and Susanna Mälkki. What a joy it was! This was my first time seeing the work live, and the lyricism, drama and wit of the score were brought out wonderfully by the performers. Gerstein's approach was very soft and romantic, although occasionally he really turned the piano into a monster. There were a few moments where I felt like some of the orchestral lines we're a bit too blurry, but this is a very minor quibble indeed. Amazing experience, I feel like my admiration for the piece has been immensely enriched. There are some monstrous passages in the work! Next: the Violin Concerto!!! Thanks to composer/pianist Lera Auerbach on FaceBook: published last June!